Many people would like to start their own businesses, but have no idea how to begin. While everyone starts a business with high hopes, the reality is that 50% of businesses fail during their first year. There are many reasons why businesses might not succeed, but lack of planning, wasting time on unnecessary tasks and not following through with legal requirements are some of the possibilities. 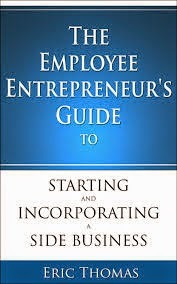 The book The Employee Entrepreneur's Guide to Starting and Incorporating a Side Business is an invaluable handbook for anyone contemplating starting a new business. People who have a full-time job already need to maximize the time they devote to starting a side business. While some people might have an idea for a business, this book has some suggestions for how to start a business that will fill an existing need. Some ideas that you might not have considered before are that complaints are often a good launching point (if people are dissatisfied with how something is currently being done, can you do something about it?) as is listening to what people are talking about (you may overhear a good idea at any moment!). Once you have an idea, keep in mind that your side business should generate income, allow you more free time, and possibly eventually allow you to leave your full-time job. The main focus of the book is giving great practical advice on the nuts and bolts of setting up your side business. The author discusses the tools you need for your business (including such things as having a professional-looking logo, website and business cards) as well as suggesting sites where the budding entrepreneur can get such things. There's also a great chapter on when you should outsource jobs and how to go about hiring, paying and evaluating the service you receive. Most useful for those starting a business is the discussion of how to set up the business structure. The comparison of the various possibilities (sole proprietorship vs. S corp vs. Limited Liability Company, for example) is especially helpful. The appendices at the back of the book include samples of an LLC Operating Agreement and Articles of Organization for an LLC, both of which have been explained in earlier chapters. The amount of detail covered is really amazing. The book even covers such things as how to come up with a name for your new business and specific rules governing some aspects of creating an LLC in certain states. I had no idea of the amount of preparation and the sheer number of details that must be considered when setting up a business. Real world examples of business mistakes and how to correct them help to illustrate the points in the book. I was also impressed by the clear, easy-to-understand text and the vast amount of important information included in this slim volume. Get this book to get your business started off on the right foot!